Technology offers an enormous opportunity to encourage team work and deliver a better customer service. Discover how. Team work is essential to the performance of a practice. But without having the right system in place, collaborative working will never happen. This e-book explains how to encourage people to work together and improve customer service with the help of technology. Web-based client portal solutions were specifically designed to enable clients and fee earners to collaborate, exchange documents, track and complete tasks in a simple, time-effective manner. How cloud computing works and why should law firms adopt it? The functionalities of cloud-based client portals- how do they work and how is your data managed? What are the benefits of using such solutions in terms of profitability, efficiency and staff productivity? 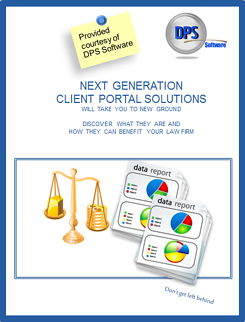 What are the most important mistakes to avoid when selecting a client portal solution?